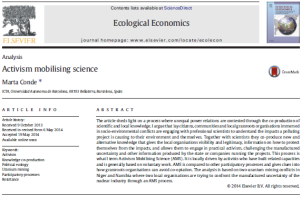 The article sheds light on a process where unequal power relations are contested through the co-production of scientific and local knowledge. I argue that lay citizens, communities and local grassroots organisations immersed in socio-environmental conflicts are engaging with professional scientists to understand the impacts a polluting project is causing to their environment and themselves. Together with scientists they co-produce new and alternative knowledge that gives the local organisations visibility and legitimacy, information on how to protect themselves from the impacts, and allows them to engage in practical activism, challenging the manufactured uncertainty and other information produced by the state or companies running the projects. This process is what I term Activism Mobilising Science (AMS). It is locally driven by activists who have built related capacities and is generally based on voluntary work. AMS is compared to other participatory processes and gives clues into how grassroots organisations can avoid co-optation. The analysis is based on two uranium mining conflicts in Niger and Namibia where two local organisations are trying to confront the manufactured uncertainty of the nuclear industry through an AMS process.